I have always loved brain teasers and riddles ever since I was a little boy, and now that I am a teacher, I love giving these problems to my students and watching the way their brains scramble to try and find the answer – often students can surprise you when they’re pushed outside of their normal boundaries of thinking. 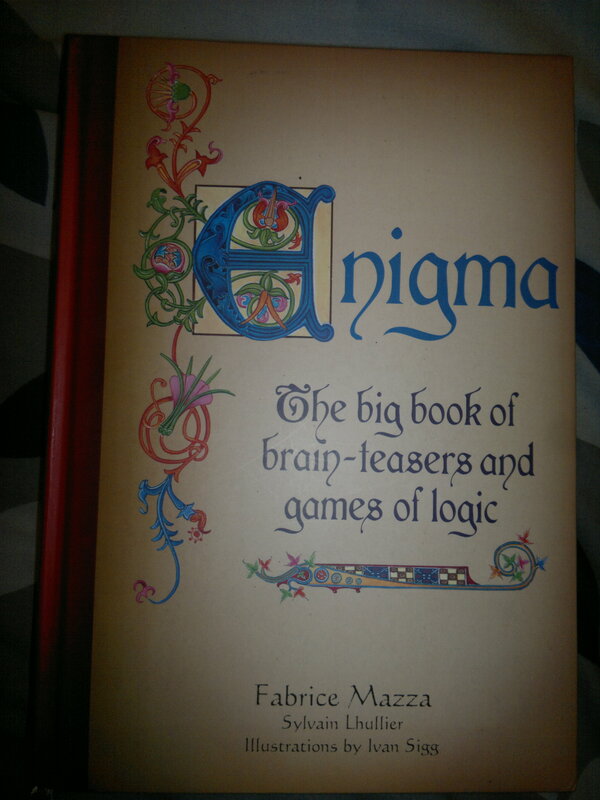 I have a few brain teasers I’d like to share with you all, but first I want to mention the neat little book from which I am finding them – Enigma, by Fabrice Mazza and Sylvain Lhullier (with illustrations by Ivan Sigg). I found this book on sale at a stall just outside a book shop, and I just couldn’t help myself – I had to have it, both for teaching and for myself! It contains over 170 different puzzles (complete with solutions at the back), and the puzzles cover everything from brain teasers and riddles, to games of logic, word games and paradoxes. 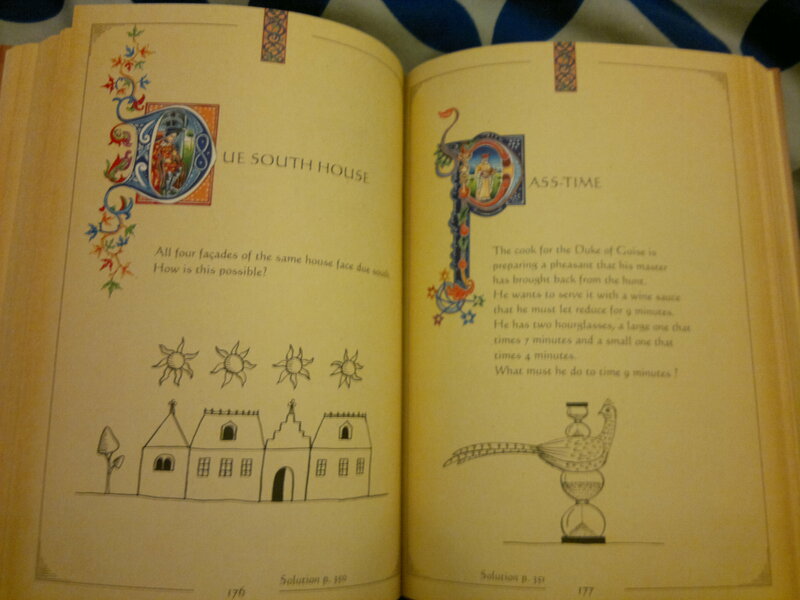 Each puzzle is on a separate page, most accompanied by illustrations which often demonstrate the problem. The pages are also stained a little, and decorated to create a sort of medieval feel to the whole thing, which personally I really like. I’ll include a few of my favourite puzzles here – feel free to leave your guesses at any or all of the puzzles as a comment, and I shall reveal the answers later this week! At a tournament, there is a tie between two knights. To decide between them, the king says to them: “See the tower rising over the horizon? The one whose horse arrives last at the tower will win the tournament.” With these words, both knights run to the stables, mount a horse and head straight towards the tower at a great gallop! How can we explain the knights’ illogical behaviour? Godfrey of Bouillon has five children. Half are daughters. How can this be explained? During a knights’ tournament, a man and his son are two of the candidates in the lists. The father is hit by a lance and he dies on the spot. His son, also wounded, is carried into a tent. The doctor in charge of examining him leans over the stretcher and exclaims “My God! It’s my son!” How is this possible? Three travellers stop over at an inn, where they hire a room for 30 pennies a night. They each put in 10 pennies. Because the innkeeper likes them, he lowers the price to 25 pennies and gives them back 5 pennies. But there are three of them, so they take 1 penny each and leave the 2 pennies left over as a tip. So each of them has paid 9 pennies (3 x 9 = 27) and the innkeeper gets 2 pennies back. But 27 + 2 = 29. Where has the thirtieth penny gone? How can you make 24, using each of the numbers 5, 5, 5 and 1 once? The only operations allowed are addition, subtraction, multiplication and division (but you can use brackets, too, to play around with the order of the operations). Leave your guesses in the comments section, and feel free to ask brain teasers of your own if you know any good ones! And if you don’t want to accidentally find out the answer, be sure not to read comments from other people just in case they’ve cracked it! This entry was posted in Books, Silly stuff and tagged Books, Brain Teasers, Enigma, Riddles. Bookmark the permalink. Puzzle one – they mount each other’s horses. Still wondering about the daughters and there’s no way I’m doing the number ones – I’m hopeless with numbers – I do love puzzles and riddles though. we’s clever isn’t we !!!! Man you guys are good!!! I was trying to figure out # 1 but think Diane may have come up with the answer. For # 2, the man must have adult offspring in order for him to have an even number of daughters. I’m pretty sure Diane is right about # 3, as that is what I was thinking, too. As for the other ones, my self-diagnosed Math dyslexia makes number puzzles a mystery to me. FUN. I got two and three immediately, but it took me a while to get one. Let me know if I’m right? 1. The king said “whoever’s horse”. But they just mounted “a horse”. So they got on the other knight’s? 2. The other half are daughters, too. He has five girls. I broke my head on the fourth one. The way I see it, they each said nine. So that’s twenty seven. Which is the reduced price + the two coins given back. That fits. So that leaves the three, one each, they took. Thirty. ” So each of them has paid 9 pennies (3 x 9 = 27) and the innkeeper gets 2 pennies back. But 27 + 2 = 29.” While both those statements are true, they aren’t related to each other in this context….right? Yep, you’re right for the first three. The second one annoys people, because people feel cheated by the answer, hahaha, but I think it’s clever. You’re exactly right about the fourth one – the wording of the question is purposely misleading to make people question the maths, when actually it works fine and there is no missing penny. I didn’t get #1 or #2. I think the key to #1 is that the winner will be determined by which horse gets to the tower, not which knight, but I don’t know where to go from there. I’m baffled by #2. I’ve already heard #3 (although the version I heard didn’t involve jousting), so I know the answer is that the doctor is the boy’s mother. I actually sat down with 30 pennies to figure out #4. When the innkeeper gave the knights five pennies back, he kept 25 pennies. Once the knights kept 3 pennies (one each) and gave the innkeeper 2 as a tip, the innkeeper had 27 and the knights had 3. Wow, a total of 30 pennies! The question as written is misleading. It’s not that they have paid 9 pennies AND THEN 2 more pennies (as the question tries to tell you); it is only after they have each gotten 1 penny back and then payed two more pennies to the innkeeper that the knights have payed 9 pennies each. After all the money has been added and subtracted, the innkeeper has 27 pennies (30 – 5 = 25. 25 + 2 tip = 27) and the knights each have 1 penny (10 x 3 = 30 payed. 30 – 5 back = 25 paid. 25 + 2 tip = 27 paid. 30 – 27 paid = 1 penny left for each). I don’t know if this is a clear explanation, but obviously there is no extra penny. You’re on the exact right track with number 1, you’ve just got to think what each knight could do with that information you just figured out! Two is a bit of a trick question – the answer annoys some people hahaha. Three seems to be the commonly known one, by the seems of things. I tried to figure it all out myself, but I was tempted to look at the comments. I did and so the answers. 🙂 Great question and that sounds like a right fun book!! I remember when I was little, I had a kids book that asked you to solve crimes with certain facts. This reminded me of that. Thanks for sharing! 1-3 were solved by greater minds than mine. There isn’t an extra penny. The question is double counting the 2 pennies. They paid 9 each, but that includes the innkeepers tip. You’re exactly right about 4 and 5. I was wondering if anybody would finally crack the fifth one – that one really stumps a lot of people, especially my students. They often think they’ve got it by multiplying 5 by 5 and subtracting 1 until I ask them what they plan to do with the remaining 5, hahaha. I managed to get 3 and 4 but won’t put the answers as they’re already spelt out above. Five managed to harass me for a while and then I just gave up – probably would have thought some more about 1 and 2 but inadvertently saw the answers above. Good riddles though! I love things like that.